READERS PRAISE MARTSCHING’S FIRST BOOK! 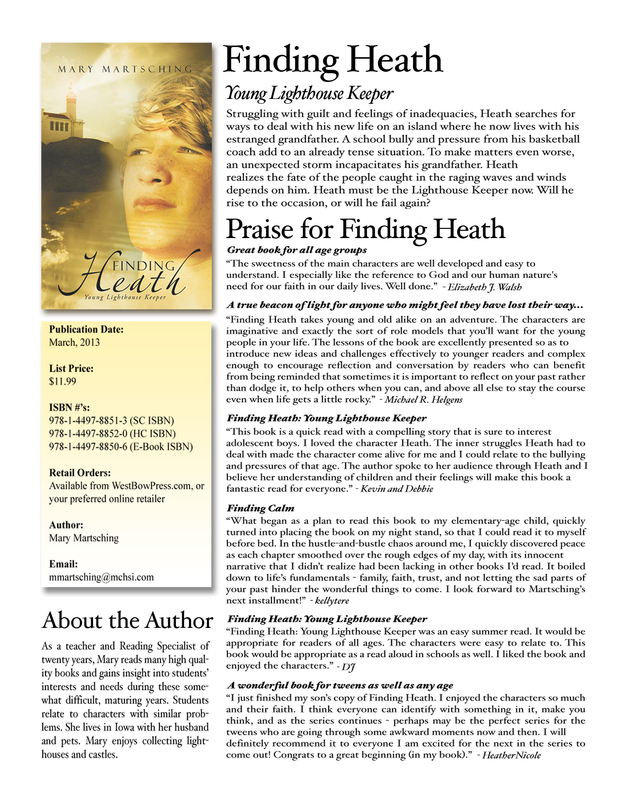 Here are what readers of Finding Heath Young Lighthouse Keeper are saying about my book. I am thrilled that various ages enjoy different aspects of it! Visit WestBow Press, Amazon.com, or Barnes and Noble online, buy your copy, and see for yourself why these readers are anxious for the next book in this series. Wecome to my blog! I am a Christian wife, mother, and grandmother who wants to share my lifetime experiences with those who share the same interests and roles. I served as an educator for twenty-one years as both a classroom teacher and an Instructional Services Consultant. Most recently I chose to write children's books. This new path as an author led me to create this website. I seek to inspire, uplift, encourage, and advise those who come here who share common interests or life experiences as myself. This entry was posted in My Books and tagged Amazon.com, appropriate, appropriate for schools, Barnes, Barnes & Noble, beacon of light, bullying, calming effect, characters, children's feelings, conflict, faith, fantastic read, Finding, first book, Goodreads, humor, lessons in the book, lighthouse keeper, lost their way, praise, pressures of life, published, role models, stay the course, Thomas Nelson, Twitter, understanding children, WestBow Press. Bookmark the permalink. 1 Response to READERS PRAISE MARTSCHING’S FIRST BOOK! Mom’s copy is making the rounds of her widow’s group @ Calvary Baptist in Mt. Pleasant.